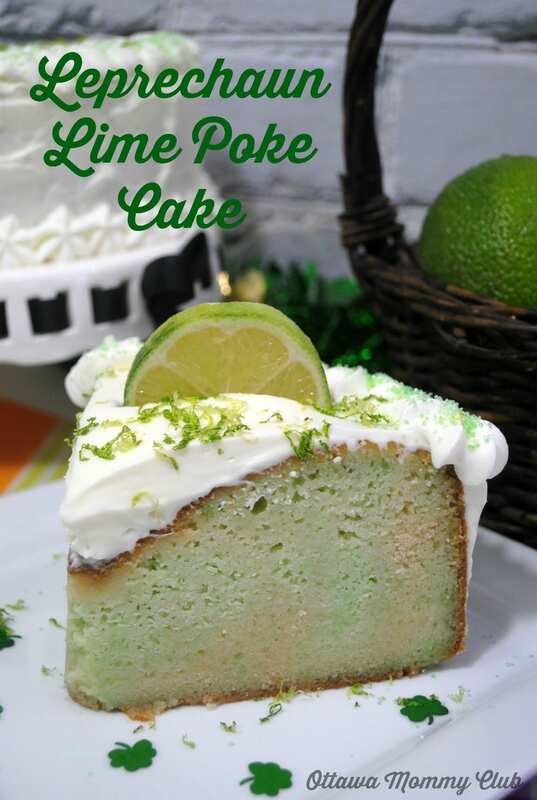 You will not regret making the Leprechaun Lime Poke Cake for St. Patrick’s Day. It is sublime! -Set oven rack in the lower third of the oven. -Whisk; flour, baking powder, baking soda,and salt in a medium bowl. -Beat granulated sugar and soft butter at medium speed until very light in color and also fluffy. -Scrape down the sides of the bowl as needed. -Reduce the speed of the mixer to it’s lowest setting. -Now while the mixer continues to run, add 1/3 of the flour mixture. -Now add 1/2 of the buttermilk mixture. -After adding the buttermilk mixture, add 1/2 of the remaining flour mixture. -Next alternate by adding the rest of the buttermilk mixture and lastly the rest of the flour mixture. -Scrape the sides and beat until well mixed. Spread the batter evenly into your baking pan. -Bake until golden brown and a toothpick comes out clean from the center of the cake. -When baking turn the cake halfway at the 15 minute point. -Allow to cool for 30 minutes with cake still in pan. -Using a larger fork, poke holes an inch apart in the top and all the way through the cake. -Lime green jello- following the directions on the box reducing the cold water to 1/2 C.
-Place in your refrigerator for 2 hrs. -Place a large bowl in your refrigerator to cool. -Whip the cream with the sugar and vanilla in the cooled bowl until fluffy. -Spread the prepared whipping cream over the cake and sprinkle your sanding sugar (or green sprinkles) . A very nice cake for St Patrick’s Day. Love the name of the cake too “Leprechaun Lime Poke Cake”. That sounds really tasty! I never would have thought to mix jello in with cake! « Getting a Cold? It’s Snow Joke!